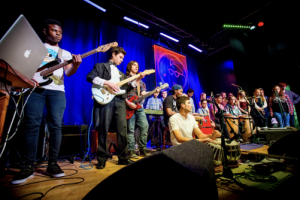 Taking place at Band on the Wall over four Saturdays this Winter, the Guide to the World of Music taster sessions will help young people learn how to sing, play and discover new music. Costing just £4 per child, each session runs from 10am – 2pm and includes free juice, tea or coffee and slice of pizza at lunchtime! Come and learn how to play reggae music! Anything from Bob Marley to Maxi Priest – get playing music after just one session. Instruments are provided or feel free to bring your own. Learn some classic songs of the folk repertoire written in Manchester and beyond. For all ages with some experience playing instruments, come and develop your repertoire! Tabla, Latin Percussion, Folk fiddle accordion and clog introductory sessions, Bollywood & Indian Classical Dance workshops and more. Whether you play or don’t play, these sessions may just change your life! For info on free bursary places, please click here. For more info on the sessions, click here.